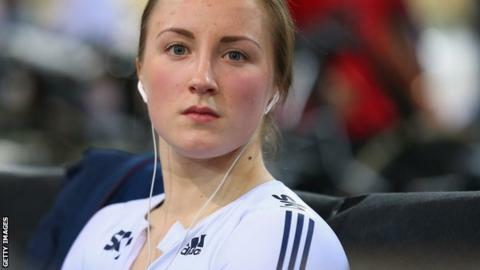 Britain's Victoria Williamson is in a stable condition in hospital after a serious crash at Rotterdam's Zesdaagse. The 22-year-old, who won team sprint bronze with Becky James at the 2013 World Championships, collided with Elis Ligtlee during an omnium race. "Out of surgery, stable, neurological signs normal, ribs, pelvis and vertebrae cracked but no damage [to] major organs," tweeted her father Mark. Racing was cancelled after the crash, with fans asked to leave the velodrome. Great Britain cycling team sprint coach Justin Grace said Williamson's injuries "gave us all a scare". He added: "From a performance point of view this is another injury to deal with - Victoria has a long road to recovery ahead of her, but her health is the highest priority for the whole team and we'll make sure she receives the best possible care." While Williamson remained in hospital, Dutch rider Ligtlee was sent home after scans revealed she had not fractured her skull or cheekbone. British Paralympic multiple gold medallist Dame Sarah Storey, Australian two-time Olympic champion Anna Meares and Joanna Rowsell Shand, part of Britain's victorious London 2012 team pursuit trio, were among those to send good wishes to Williamson on social media.